Three house sites had been recorded in 1997 on the west bank of Cadiangullong Creek to the south of the main creek crossing. They were accessible from a track that branched from the slag road at the creek crossing. Of these three house sites, one (Site W002) was chosen for excavation in 2002. The hut was clearly marked by a platform cut into the slope and by a tree that is characteristic of historical rural settlement, a Robinia pseudoacacia. Around the house site, the land sloped steeply down to the creek. What had appeared to be a single house site before investigation turned out to be several structures when opened up for excavation. The principal buildings were two post-built huts with wattle and daub walls, comprising 3 rooms (W002 and W007), with a single fireplace in the south wall of the main room. The dimensions of these two structures were approximately 12 by 21 and 12 by 23 feet each (3.7 by 6.4 and 3.7 by 6.8 metres). Each structure was in fact a very common type of building, a two-roomed hut, with central door and flanking windows, hipped roof and a chimney at one end. Huts of this type had been built from 1788 onwards and served as basic accommodation throughout the Australian colonies. They were also the standard accommodation that the Scottish Australian Mining Company had built for the miners, as revealed in the 1861 Inventory, or the Sydney Mail in 1865. While the Company had built slab huts for the miners, the different building materials used in this case suggest that a miner had extended his accommodation to cater for his growing family. There were two additional timber framed rooms attached at the back of the two main buildings, with another fireplace. Further uphill was another similar hut and fireplace (W003), though this time of simple post construction without wattle and daub, but possibly with slab walls. Finally a single roomed and timber framed structure with fireplace was erected under the shade of the Robinia (W015). 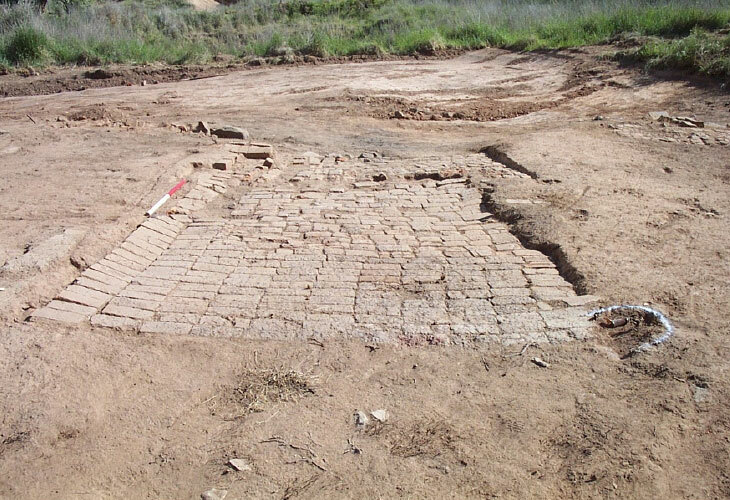 This appears to be a later structure with sheet iron for walls and a brick floor, possibly salvaged from the reverberatory furnaces of Smelter No. 1, since it included burnt bricks as well as fire bricks. All the early buildings were occupied from the 1860s through to the 1940s, though with a decrease in the rate of artifact deposition in the 1870s, which ties in with the closure of the mine in 1868. Since the early buildings are all similarly dated and in some instances unrelated structurally, it is difficult to know which was the first building. The two conjoined buildings (W002 and W007) have been described first, simply because they have left the more impressive archaeological remains. The earliest structure could have been the post built hut, possibly with slab walls (W003), which might suggest it was in fact a miner’s hut, constructed by the Company. One interesting fact about the wattle and daub buildings is that other examples have been found in the Cadia hinterland. On these other buildings the mud or daub walls were kept in place using chicken wire, nailed to the frame of posts. Some chicken wire was found at this site, which suggests the same technique could have been used in W002 and W007. The fact that the mine site was company owned poses a problem for the archaeologist. It is not possible to identify who lived in each building or hut, unless it is revealed by specific historical information. However in this case, the buildings and the large artifact assemblage reveal many clues to the family that lived here. It was no ordinary family. The occupants appear to have been as well off as mine management or the storekeepers, who could have afforded to purchase property, had they desired. In other words, the huts were occupied by someone who was a senior member of the Cadia community. There were also young children in the family, both boys and girls, as indicated by the toys they have left behind, marbles, fragments of dolls and children’s tea sets. They were literate, as indicated by ink bottles, slate pencils, writing tablets, and pencils. The women could afford pleasant perfumes when they bathed, a pleasant interlude in between cooking, cleaning, laundry, children and other chores. The buildings themselves reveal that the family required additional living space as the years passed, suggesting that there were additional children born to the family at Cadia. 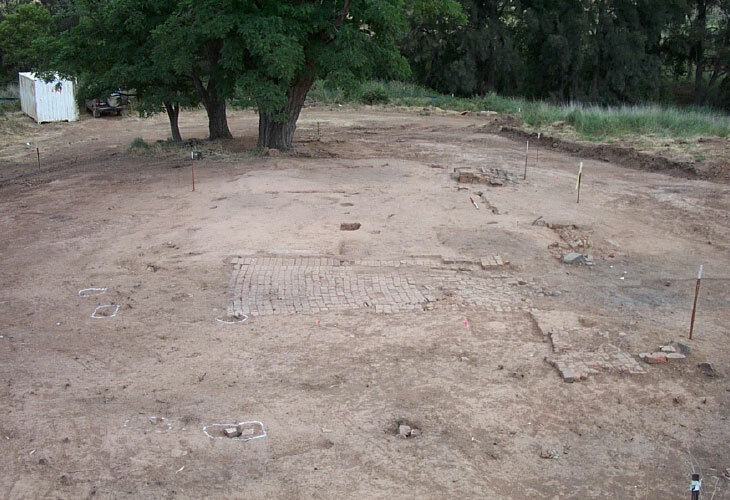 In attempting to identify the specific family that occupied these buildings, it is assumed that only one family occupied the site, rather than a succession of families. The assemblage is predominantly dated to the 1860s, with a dramatic fall off in deposition rates in the 1870s, so the shorter time span may only indicate one family. Extensive family research has been completed for all those buried in Cadia Cemetery, which narrows down the number of families that may have lived in this hut complex, but there are gaps in this research for others who came to Cadia and managed to avoid being buried there. The archaeological evidence is tantalising, but would need a historian to research all the other families at Cadia to find the most likely occupants of these buildings. Even without knowing their names, the artifacts reveal sufficient about the inhabitants of Cadia Village as a whole to help us understand the different life decisions that they made. 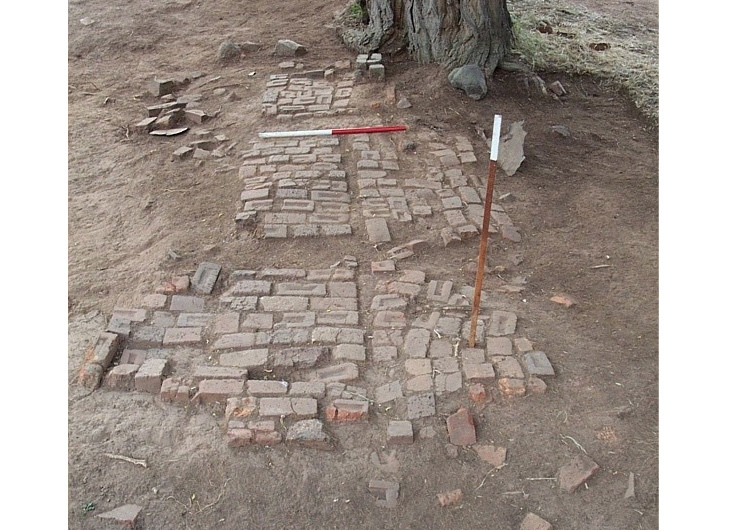 The brick paving between the buildings (W003 and W007) may have been enclosed and roofed over, but the archaeological evidence is insufficient to be certain about these construction details (scale 1 metre) (Edward Higginbotham). This typical post-built hut had wattle and daub walls and a fireplace in its south wall (W002). Although one would normally expect two rooms, there is little evidence for a partition wall in this case (scale 1 metre) (Edward Higginbotham). The fireplace in the south wall of the hut (W002) survives in good condition. The brick type, with frog, indicates that it was maintained and repaired throughout the nineteenth century. The iron rods sunk into the ground would have originally ensured the stability of the timber framing of the hut (scale 1 metre) (Edward Higginbotham). The brick floor marks the site of an addition to the building complex (W015). The building was timber framed with the walls clad in sheet iron, sections of which survive in situ (scale 1 metre) (Edward Higginbotham). 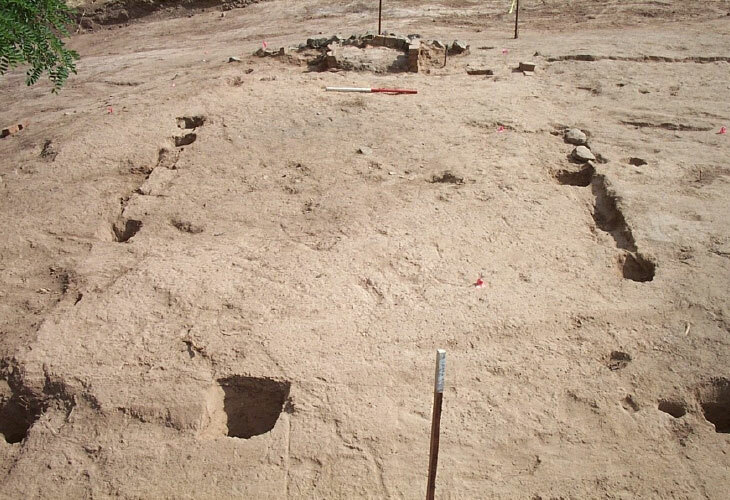 This general view of the archaeological excavations of the Hut Complex show just how ephemeral were the archaeological remains of these substantial structures. 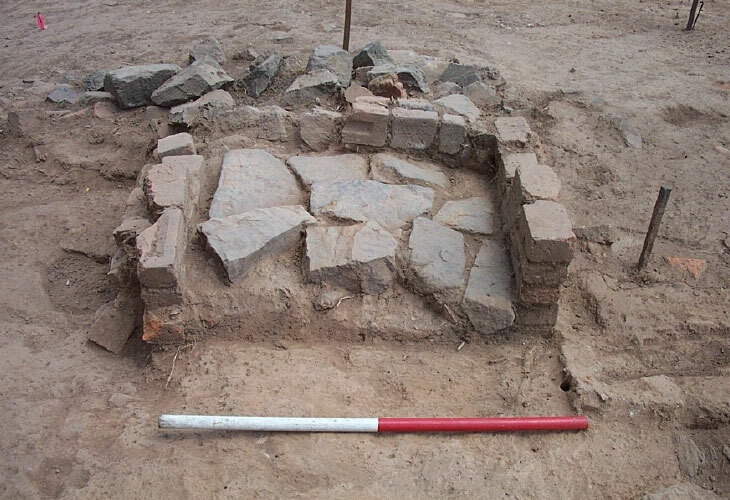 In the foreground is the floor of Hut (W003), with its fireplace on the right and then the brick paving beyond. Compare it with the archaeological plans and the layout of the site will become clearer (scale 1 metre) (Edward Higginbotham).